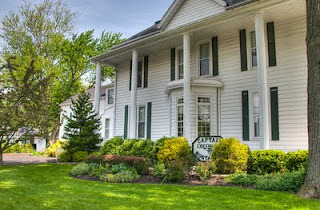 Hidden in plain sight might be one way to describe this delightful B&B in downtown Huron, Ohio. Over the years, thousands of Clevelanders have passed Captain Montague’s on their way to Cedar Point, but most likely never knew what charm could be found beyond the white picket fence, past the impressive white pillars, and inside those stately white walls. Just two blocks from Lake Erie, at the corner of Ohio St. and Center St. this majestic home is centrally located for northern Ohio recreational opportunities. Two blocks to the east and you’ll find the sparkling new Huron Boat Basin and Amphitheater. Consult the city’s website for a schedule of free outdoor entertainment here in the amphitheater. 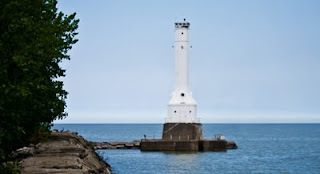 Two more blocks north and you’ll find yourself walking or biking out onto the mile-long fishing pier, crowned by the Huron Lighthouse at its northernmost tip. As romantic as a walk along the lake might be, especially at sunset, the real romance can be found inside Captain Montague’s. Entering through a double-doored vestibule with ruby glass lites, you’ll find yourself transformed back into the historic past as you sign the guest book in the foyer. Look around and you’ll find a treasure trove of brochures sitting in an old treasure trunk. If you are looking for places to go and things to do, owners Judy and Mike Tann can be a marvelous source of information. Architectural digs have confirmed that Huron had Indian inhabitants back in the 15th century, but it’s safe to say that it didn’t really catch on until the early 1800’s. After the war of 1812, and after Indian aggression ended, Huron started to boom, forming their original town plat in 1824. The Old Plat District saw many fabulous mansions built along the lakefront, but erosion claimed most of those by the early 1880’s. Safely located two blocks from the water’s edge, this Victorian Italiante home on Center Street was built just before 1880 by John Wickham, a local master shipbuilder and owner of the local lumberyard. Having access to the best woods, he used solid black walnut for the two large fireplace mantels, as well as the beautiful, massive, open staircase to the second floor. Floors shine with red oak and mahogany planks. In 1890, the home was acquired by Captain Charles Montague, who occupied this large home with wife Sarah and two children, Newton and Edith. Up until 1930, this was the scene of lavish receptions and parties, starting a heritage of hospitality for guests from near and far. 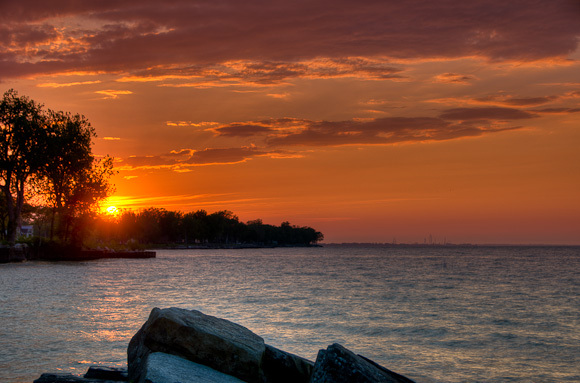 It was during this time (1913) that Cedar Point opened in nearby Sandusky. Cedar Point Road was actually one of the first concrete roads built in Ohio. Now, when you stay at Captain Montague’s, Judy will be happy to point out the best way to get to Cedar Point from their B&B. Using her directions, only one traffic light exists between the two, guaranteeing to shave a half-hour or more off your commute during weekend peak times. Truth-be-known, a lot of folks probably plan a variety of day-trips while staying at the Captain’s place, but it can be hard to get up and leave. Starting with a delicious breakfast feast courtesy of Mike and Judy, it’s never a rush to get up and leave the table. After I finished a serving of fresh strawberries and loaded French toast, I then sampled the best scones I’ve ever had in my life. The night before, I slept on the second floor, in the southeast corner in the large “Edith’s Room” with a huge ensuite bath, complete with antique basin, full shower and whimsical picket fence wallpaper wainscoting. With comfortable chairs and a luxurious queen-sized brass bed, one really need not go anywhere else, but there is so much more to appreciate throughout the property. On the first floor, the “cranberry parlor” is a wonderful sitting area for conversation or relaxation. 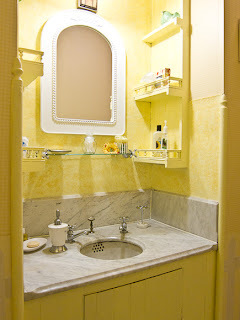 The galley kitchen is open 24-7 for guest’s enjoyment with all kitchen appliances and a stocked refrigerator. Outside, the grounds abound with fragrant flowers, crisp, clean fencing and a large gazebo. A pool is open in warm weather. Two parking areas provide plenty of off-street parking. Judy Tann said they feel “very privileged to have been stewards of this home for the past 18 years.” I think their guests are actually the ones most privileged – to have discovered such a marvelous home with such gracious hosts. If you decide to go: It’s about 50 miles west along Route 2 and exactly one hour from Public Square in downtown Cleveland. Contact Mike and Judy Tann via their website: http://CaptainMontagues.com, by email at captainmontagues@bex.net or via phone at either 800-276-4756 or 419-433-4756. Their address is 229 Center Street; Huron, Ohio 44839.